while it rains: kindergarten countdown: sight words! we just turned in the registration packet for rowan to start kindergarten next year, i repeat k i n d e r g a r t e n. we are pretty excited in these parts but we know there is a lot of work to be done to prepare her for the difference between pre-k and this new world. my sister and i always excelled in the reading area - we were both reading before or right at the start of kindergarten and my oldest, zoë, has been no exception. i wanted to start rowan off on the right foot and i knew the best way to do this was have her master her sight words over the summer. i was a little nervous jumping into it because hers and my "teaching/learning" relationship has always been difficult. sometimes it would blow my mind that she didn't understand what i was showing her, but would pick it up quickly from school no problem. speaking of preschool this year - we just had conferences and i was thrilled to hear that in a matter of words, rowan is at the top of her class. she can follow instructions perfectly, writes great, understands basic concepts, and all of the other tasks listed on the early kindergarten mastery list. meaning, she is thinking and doing like a kindergartner already! to get us started i dug through the pinterest trenches for ideas but was quickly overwhelmed. i toyed with the idea of making my own flash cards and other learning materials but had a hard time weighing the costs and time that would take. after talking to a good friend, who i knew was deep into sight words with her almost kindergartener, i decided to take a much more basic and classic approach. first, i purchased these sight word flashcards from amazon because i loved that they were simple, bright, two sided, inexpensive and came with over one hundred basic and important words. 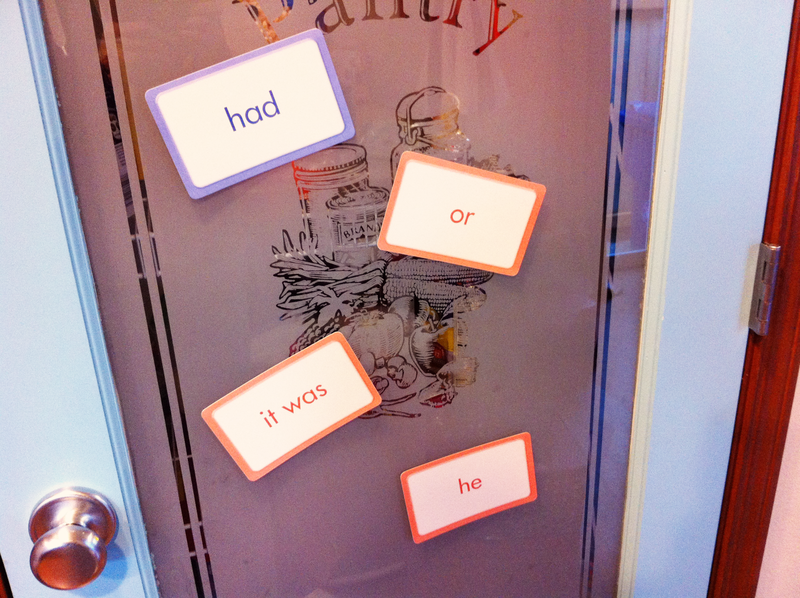 when they arrived i randomly chose four easy and well known words to start with and taped them to our pantry door, in plain view from the girls table that they eat breakfast and lunch at. then, i just casually started telling rowan what they were and having her repeat them back, once we had done this a few times i would start quizzing her. me: the! this is word is the, it is spelled t-h-e, this word is the. what is this word rowan? me: (back at the, thirty seconds later) what is this word? rowan: ta-ta-ta (trying to sound it out i guess?)...said? i am guilty of not having a ton of patience, but i knew this was no place to show my frustration, that only discourages rowan and makes her lose total focus. so i would just take a deep breath and go through the steps of spelling and repeating over and over. eventually things started to pick up and she was getting most of the words down really quick! our system was - once she had a word down for a day or two, no problem, not getting it wrong once, we would either flip the card to the back side or grab a new one if we had done both sides. rowan always got down three out of four immediately but still struggled with words like had or will. the cards we had removed we kept in a separate pile so i could pull them out and quiz her randomly, she still does really good with them. we mostly work on the ones on the door at meal times and other times i'll randomly call her in for a quick quiz that sometimes earns her a treat if she gets them all. stella is even in on this and will call rowan in for a quiz, even though she has no idea if she is getting them right, haha. three weeks in and rowan has mastered twenty+ words, even some two word cards, and is going strong picking up new ones every few days. i am so excited that our method is working out, it has really been a lesson in not over complicating things. she didn't need all those work sheets and games to learn. however, i plan on introducing bingo and other simple activities once we have mastered maybe twenty more words. i get super excited when she knows a word already, like this morning i put up a new card that was on and she shouted that one out right away and the or we did the other day, she was said, "like the beginning of oreo (this kid and her food...). she will even use them correctly in her own sentence from time to time - this reassures me that she easily recognizes and understand the meaning of the words which is just as important as learning the sight of the word. i get excited at the thought of moving onto the bob books or other first readers that are full of these words she is grasping so quickly. we might just have her reading by kindergarten! i would love to hear about your sight word journeys! did you come up with a fun method to teaching them? or did you keep it basic like us? Sight words are great for M & M bingo!!!!!!!!!!!!!!!!!! Thanks for this post. I am thinking of starting something like this with Dane since he is constantly questioning what words are now.